The first model of Robot Leela. Robot Leela is a robot supposed to look like Leela who was created by Robot Fry after her irreversible coma. After the PE ship's crash, the Professor used his Rebirth machine to make the crew rebirthed, but Leela was still in coma. Robot Fry then went to Build-A-Bot Workshop to build a Robot Leela. At first she is only vaguely similar to Leela, but Professor Farnsworth copies all of Leela's traits into Robot Leela. Robot Leela now looked exactly like the real Leela, thought exactly like her, and had all of her same memories. She, supposedly like Leela, is in love with Fry. She almost instantly discovers she's a robot and not the real Leela when her pet Nibbler bites part of her arm off, exposing her wiring. She goes on one date with Robot Fry, before anyone but Professor Farnsworth knew he wasn't the real Fry, but she questions if her feeling for him are hers or Leela's, so they become just friends again. At Leela's funeral at the Cyclophage reserve, Leela wakes up from her coma and sees Robot Fry and Robot Leela kissing. Leela, also not knowing that this Fry was really Robot Fry, is upset with him, but later forgives him. Robot Leela is jealous of Leela and fights her over Fry's love. During the fight, it is discovered that Fry was really a robot that Leela had built (see "Rebirth" for more info). Robot Leela decides she is in love with Robot Fry, and they take off their "meat suits" and leave together, their voices changed for an unknown reason. 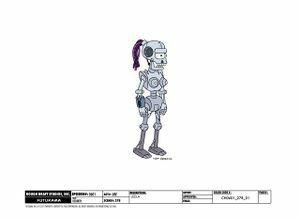 Robot Leela's concept art was released during the Countdown to Futurama on the 7th May, 2010. She does not have a wristlojackimator like Leela does, except in her final robot form. When she removes her human skin and face, her voice changes to sound like the T-800 from the Terminator films. Robot Leela: We'll be back... for our stuff.